Linoleum is a traditional material which is once again popular in furniture construction. Due to the high demand, Ostermann has now developed ABS edgings that match the Desktop surfaces of Forbo furniture linoleum perfectly. The high-quality, slightly elastic furniture linoleum has a pleasant, unique feel. Furthermore, it has anti-static, slightly fungicide and bactericidal properties. Therefore, it is a real trend material for public buildings, office spaces and surgeries as well as in private furniture construction. It is available at Ostermann in many appealing colours. 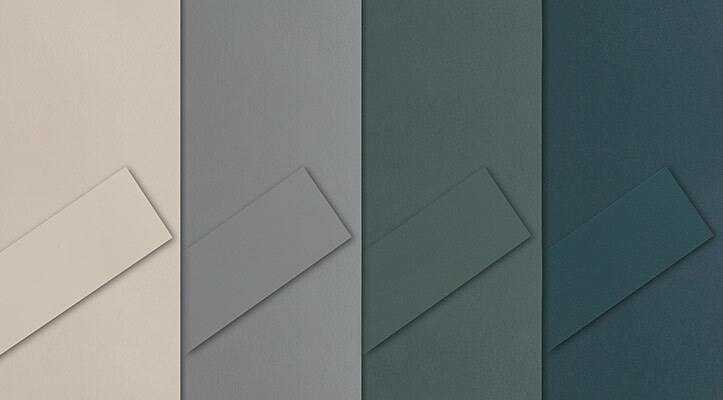 For numerous standard colours within the Desktop collection Ostermann has just developed and personally matched the relevant ABS edgings. These are not only a perfect match in terms of colour, but also reflect the special feel of the surface with their unobtrusive velvet finish. The edgings are available in the standard dimensions 23, 33, 43 and 100 x 1 mm. The edgings specialist will be happy to send a sample swatch on demand. The velvet structure is a fairly calm surface finish with an unobtrusive, filigree feel. The matt surface with its subtle and calm structure is quite resistant to scratches, smudges and stains, and therefore perfectly suited even for furniture elements with higher exposure. With its familiar fast delivery service for stock articles, Ostermann supplies edgings made from ABS, melamine, acrylate, aluminium and solid wood, in every length starting from 1 metre, and in every width up to 100 mm. Europe's largest range of edgings comprises more than 12,000 edgings to match the board surfaces of more than 70 board suppliers. Always included: the matching edgings to the current furniture trends! All information on the above-mentioned edgings can be found when typing in the search item "Highlights052019"